Let's approach Singapore Half Ironman strategically, my weakest link is obviously cycling. I found it quite taxing to cycle a road bike despite having some experience on a mountain bike; and during the Sundays' Brick trainings, I found it impossible to run even at a normal pace after being on the bike for an hour. I begin looking up resource on how to cycle more efficiently and was delighted to found that just like swimming, there is an art to cycle efficiency, I am probably applying the wrong force and ended up straining my hamstring too much. The most insightful article I read can be found in Coachseiji.com. Read on for my summary. I used to think of cycling as an up & down motion like a piston, but if I am applying force vertically up and down, then only at 3 o'clock and 9 o'clock would my force be at a tangent to the circle that the pedal is traveling at. Compare to a efficient cycling technique, I am also loading up my hamstring in both the up and down cycle leaving no room for it to relax. Since the hamstring is involved in both hip extension (down) and knee flexion (up). Instead you should be thinking of moving your foot around a circle in 3 phase. #1 The downstroke beings at 11 o'clock of the cycle, you should used your quadricep to kick your feet forward and down to 4 o'clock without relying on the hamstring to extend the hip too much. #2 The backstroke begins at 3 o'clock, overlaping the previous phase, use your hamstring to flex your knee like kicking backward on sands, this takes you pass 6 o'clock to 7 o'clock, providing your other foot power to move forward while it is at 12 o'clock. #3 The upstroke begins at 7 o'clock, the aim is to take the weight of your foot off the pedal by lifting it up. The hip flexor will be used to bringing your knee up in running. The writer of the articule emphasis to "lift" the foot but not to "pull" the pedal up at this phase as that will involve the hamstring muscle which should be relaxing at this stage. It would be an in efficient use of energy to pull up the pedal anyway. Doing it right, your cycle stroke is more horizontally than vertically, the power output will be more evenly distributed from 11 o'clock to 7 o'clock of the cycle. The ruthless me is back! Singapore Ironman 70.3 - I have just signed up for it. It will be on 2nd September 1.9km swim+90km bike+21km run. Not much time left really for the training, so it will be another dive in and see what happen episode on Freeyasoul Adventure. I suspect this is what you guys want to see on this blog, right! I can't wait to tell the world, the weather finally turn out to be superb on a race day, no red tide and no thunderstorm. 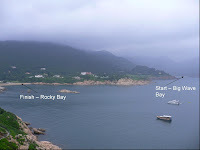 I signed up for a Shek O Challenge, a 2.2km swim from Big Water Bay to Rocky Beach. It was a small party, I think only 60-80 people were there. After the baptism of Scottish Winpipe and Afro drums, the whistle was blew and finally launched myself to my first open water race (need reminder of my disappointment last year, read this). I tried everything I have learned recently, the total immersion streamlining tricks, the trianthlon sighting technique and drafting behind people but I just slam into everyone that I tried to draft, so I just overtook them. Finally after racing pass two floats, I can see the orange flags and finishing arch on the beach. I found that I still have an extra gear to put on. The result was a mere 48mins!!! If I was to do the same last year, it would be over an hour. I took a beer and drank to my improvement. After hearing the success of Alex, I've been spending a lot of time in the small pool practising the total immersion drills, still not quite there yet but I am now paddling at a much more leisure pace yet still being able to keep up with the faster guys in my lane during the club's pool sessions. The total immersion theory really emphasis on body roll but this week I heard from the "Tri-Talk" podcast that body roll may not necessarily mean faster speed. In this week's episode, David Warden, the host, talk about research done on 6 competitve swimmer by analysing their swimming stroke and speed. One of the interesting finding is that when the velocity of the swimmers increases, the degree of body rolls actually decrease. Quite in contrary to what was taugh in total immersion. The swimmers maintain a total body roll of 118 degree at a fast pace while 133 degree at a slower pace when doing a 1500m swim; at 50m sprint pace, the body roll was only 114 degree. Since picking up the TI swimming, I have been really trying hard to exaggerate the body roll maybe I should just be doing what it feels right. If the weather holds this weekend, I have signed up for a open water swim, the distance is 2.2km from Shek O beach to Big Wave Beach. Let's see how much I have improved.